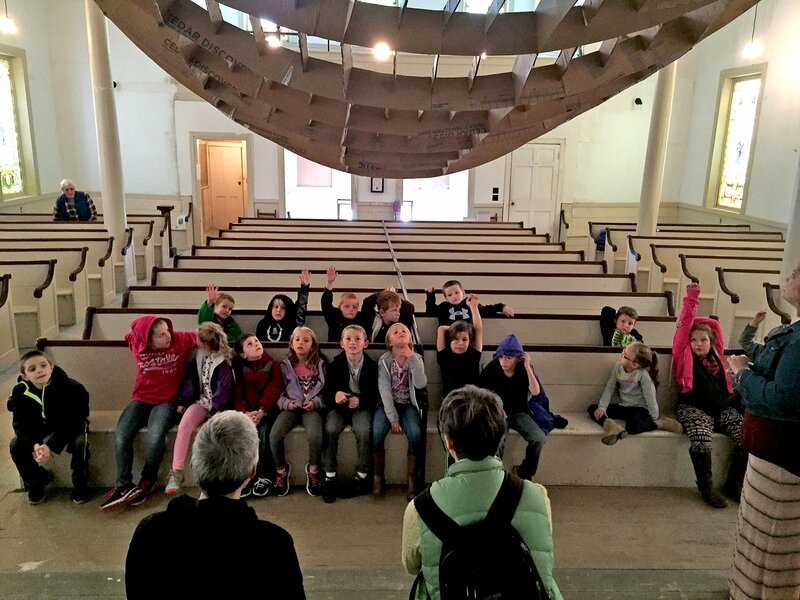 Eastport (Maine) Elementary school students during a visit to TIMA’s Free Will North Church Project Space in September 2016 to view and discuss the large scale art installation, Undertow, (partly shown above the students in the photo) by artist Anna Hepler. OUR EDUCATION PROGRAM is built on audience engagement that inspires through hands on experiences and the thoughtful exchange of ideas offered by dynamic contemporary artists and historic works of art. The largest object of our collection, our historic 1887 building, is itself a work of art that has undergone meticulous floor to roof, interior and exterior restoration. Through the StudioWorks program our print shop hosts after school classes and adult workshops in letterpress, digital, and traditional printmaking techniques led by award winning visiting artists. These have included collaborative community posters produced by our Hand Line Press. In the last year we have hosted visiting artists to lead workshops in printmaking, photography, poetry, illustration, song writing, public sculpture and traditional arts in our schools and surrounding communities. In addition to artist talks, our visitors enjoy Visual Thinking Strategies [VTS] sessions in our galleries featuring contemporary works and selections from our permanent collections. Pre-visit and post-visit school VTS sessions engage our audiences to make the most of a field trip to the Tides Institute & Museum of Art. Visual Thinking Strategies is a teaching method and school curriculum that centers on open-ended yet highly structured discussions of visual art, significantly increasing students’ critical thinking, language and literacy skills along the way. We serve educators and their students through our on-line place-based and museum collections resources initiative, Washington County’s Quality of Place, on topics related to visual art, architecture, history, cartography and material culture. Included in this initiative is an on-line database of rotating 360-degree panoramic images documenting and interpreting the natural, built, and culturally significant landscapes of Maine’s easternmost coast and adjacent areas. More than 120 rotating panoramic photographs of these local and regional places are collected on our panorama page: Panoramas. In addition, an initial view of our collections database is now also available on-line: Art. 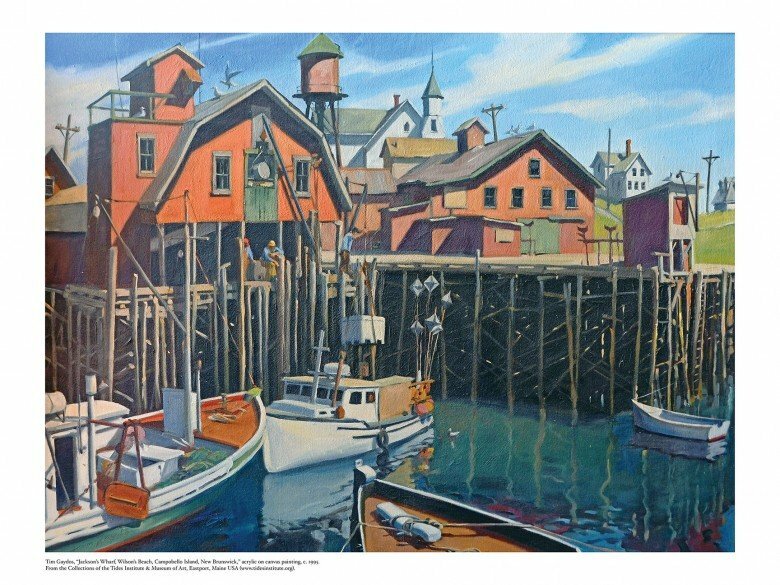 TIMA has spent the last year and a half developing two new sets of educational materials that use images from its extensive and significant collections relating to the region of the eastern coast of Maine and neighboring New Brunswick. This will be the first time that the region’s artistic legacy will be incorporated in school materials made available on a large scale. The initiative, called ArtLink, is an effort to better connect TIMA’s collections with area schools and students. 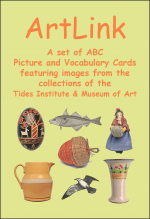 The materials are a set of 10 double-sided 18” x 24” TIMA Collections Image Posters printed on heavyweight paper stock and a set of 26 ABC Picture and Vocabulary Cards in a boxed packaged format. The materials are being distributed to visual art teachers and early childhood educators in schools and childcare settings throughout Washington County, Maine. The project is led by Kristin McKinlay, TIMA’s Director of Education, with assistance from several area teachers including Fern Hilyard, Washington County (Maine) Passages Program; Debbie Little, (special education) Calais, Maine Elementary School; Lisa Marin, (visual arts teacher) Jonesport, Maine Schools; and Sara Myrick, (visual arts teacher) Eastport, Edmunds and Perry, Maine Schools. Rosamunde Bordo, TIMA Program Assistant, 2017, also helped with image selection. McKinlay says, “We’re excited to be introducing our collections to a wide audience through these publications. This project will allow students to grow up familiar with key works of art from their own region, and practice early literacy and visual literacy with activities based on these artworks.” Generous support for the project has come from two private foundations. Funding from these two foundations is expected to continue for further development of the project. The poster series idea is based on the Picturing America project of the National Endowment for the Humanities that brought American masterpieces in poster format to schools across the country. 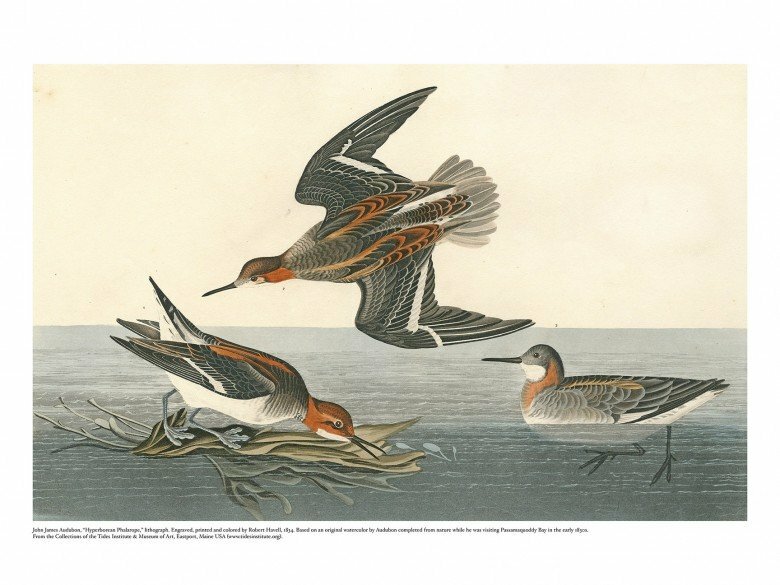 Images in the TIMA poster series range from John James Audubon’s print, “Hyperborean Phalarope,” based on his studies in this region in the 1830s, to a recent Molly Neptune Parker Passamaquoddy fancy basket to a contemporary raku-fired ceramic vessel by Tim Smith of St. Andrews. Pairings from the poster series are designed to be used in classroom discussions supporting critical thinking skills, such as the Visual Thinking Strategies method. 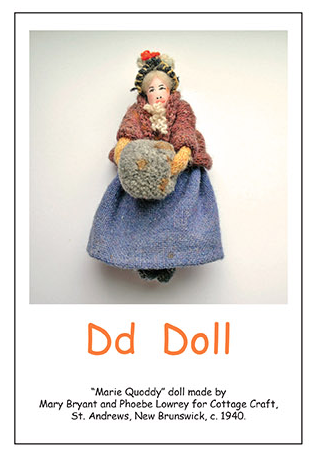 Images for the TIMA vocabulary alphabet card series include “D is for Doll” using an image of a “Marie Quoddy” doll made by Mary Bryant and Phoebe Lowrey for Cottage Craft, in St. Andrews, New Brunswick, c. 1940; to “L is for Lobster” using an image of a colorful lobster can label design for Machias Bay Lobster (Maine), c. 1880. 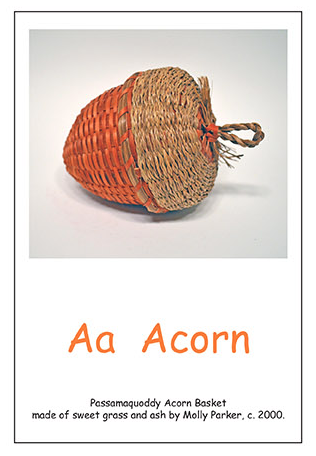 Vocabulary cards are sized for young readers and will support early literacy programs. Contact us to arrange a visit and to learn more about how your classroom can benefit from access to our collections.